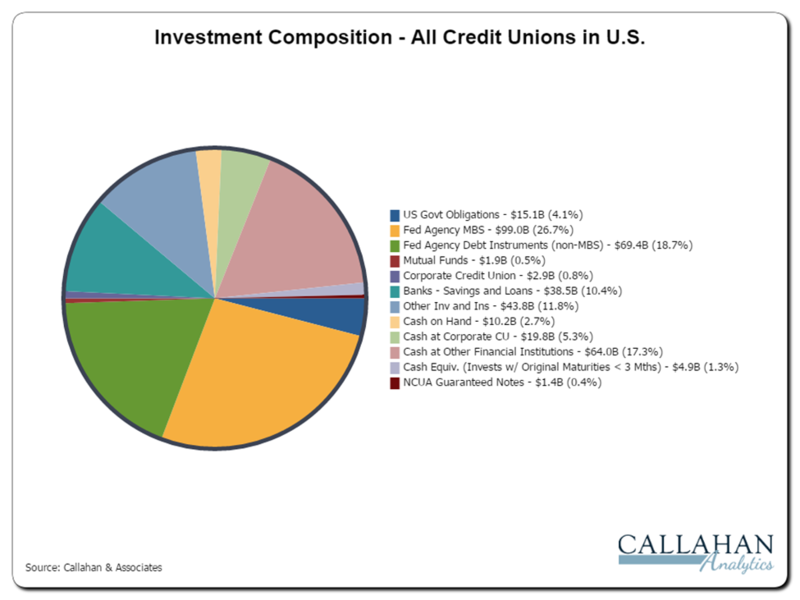 Credit unions held $371 billion in investments as of Dec. 31, 2016; that’s down 2.5% from third quarter. Total investments in 2016 have followed the typical trend of gradually declining through the year as lending picked up and deposit growth slowed after the first quarter. Total credit union assets expanded 1.3% over the same period to $1.3 trillion. Loan balances increased at a rate of 2.7%, resulting in credit unions diverting investment dollars to relatively higher yielding loan products. The net $9.7 billion decrease in investments during the fourth quarter was the result of a $10.1 billion decline in cash at other financial institutions (Fed balances), which fell from $74.1 billion to $64.0 billion. Cash at corporate credit unions and Agency MBS also contracted over the period, falling $2.0 billion and $1.2 billion, respectively. US Treasuries and cash on hand were the only categories to post increases over the third quarter, with Treasury investments increasing 53.7% to reach $15.1 billion. Collectively, agency debt and MBS continue to be the preferred investments, representing 45.4% of the investment portfolio. Interested in more information about the industry’s average yield on investments, investment maturity, and derivatives usage? Download your complimentary copy of the full Fourth Quarter Investment Trends Review from www.trustcu.com today or contact Trust for Credit Unions at TCUGroup@callahan.com. TRUST helps credit unions succeed in serving their members by providing a professionally managed family of mutual funds — exclusive to credit unions — as well as the information and analysis they need to support investment decisions. Created by some of the leading credit unions with oversight by a board of trustees, TRUST’s mutual fund options allow credit unions to meet their short duration needs, are professionally managed, and are based on the cooperative values of credit unions. Visit www.trustcu.com or call us at 800-237-5678 to learn more. The Trust for Credit Unions (TCU) is a family of institutional mutual funds offered exclusively to credit unions. Callahan Financial Services is a wholly owned subsidiary of Callahan & Associate and is the distributor of the TCU mutual funds. Goldman Sachs Asset Management is the advisor of the TCU mutual funds. To obtain a prospectus which contains detailed fund information including investment policies, risk considerations, charges and expenses, call Callahan Financial Services, Inc. at 800-CFS-5678. Please read the prospectus carefully before investing or sending money. Units of the Trust portfolios are not endorsed by, insured by, obligations of, or otherwise supported by the U.S. Government, the NCUSIF, the NCUA or any other governmental agency. An investment in the portfolios involves risk including possible loss of principal.